083. DISCOVERY. Issued by Sanitarium Health Food Company, Auckland, New Zealand (1958-59). No. 14 in a set of 25 cards titled "Famous Ships in History". Size: 3.4+" x 2.3+". 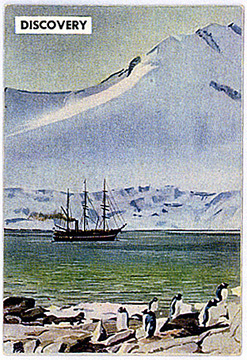 Recto: Color painted view of the Discovery with penguins on rocky foreground, snow-covered mountain in background. Title in upper right corner: Discovery. Verso: FAMOUS SHIPS IN HISTORY | A SET OF TWENTY-FIVE CARDS | (No. 14) DISCOVERY | It was in the Discovery that Captain Scott sailed for the [sic] the Antarctic in 1900. She was built for this Expedition in Dundee in 1900, proving to be a fine sturdy vessel. On this Expedition she weathered two of the severest winters known, held fast in the pack ice and withstanding great pressure.